Thanksgiving has passed, so you know what that means – Christmas season. And what does Christmas season usually entail? Decorations. Whether it’s lights, ornaments or a simple mistletoe, decorations are part of the holiday season and there’s no better way to spice up your home during the holiday season than flowers. Flowers are a great way to liven up your home and create a perfect accent that falls in line with the holidays. Here are some holiday flowers that will make a great centerpiece to get your Buffalo home in the true holiday spirit. Roses – Red or white, roses are the prettiest of all the flowers and are sometimes the most meaningful. With a centerpiece arrangement that features roses, you know it’s going to not only look pretty, but smell good too. Peruvian Lilies – White flowers with green leaves, this South American based flower, combined with a red flower, like a rose or a tulip, can be create the perfect red, white and green centerpiece for your home. Red gerbera daisies – these cute flowers make for a fun centerpiece that is sure to liven up a room. They’re not as majestic as a red rose, but its big flower is very attractive and sure to turn heads. Peppermint carnations – Peppermint is probably the sweet of winter and so are its candy cane colors. Peppermint carnations embody the spirit of Christmas in its flower with a delicate touch of red along the white flower. It’s a must have flower of the season. Poinsettias – This isn’t a flower, it’s the most popular plant of the season so it has a home here. The story of how the Poinsettia became known as the Christmas “flower” so to speak began in the 16th century when a little Mexican girl, who was too poor to provide a gift for the celebration of Jesus’ birthday, gathered weeds for a gift that sprouted into beautiful poinsettias. It has been said the leaves symbolize the Star of Bethlehem and the red leaves ate the blood sacrifice of Jesus. If you really think about it, Thanksgiving weekend is a really good time for a wedding. The weather hasn’t completely turned to the bitter coldness of winter, you’re coming off a great holiday with your family, and most of your family will already be in town from the holiday – so why not make it an action packed Thursday through Saturday in late November! Another perk of having a Thanksgiving wedding, are the flowers. 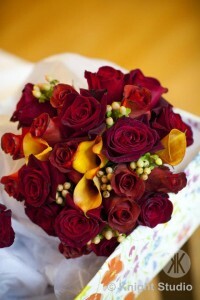 An array of reds, yellows, whites and oranges will make your bouquet a fall classic, just like Thanksgiving. Roses (white, red or peach) can accompany carnations (burgundy, or yellow) and pretty daisies (yellow, white or pink) to make a brilliant Thanksgiving centerpiece or bouquet. Lots of reds not only show love, but it fits right in with the fall season. Check out this bouquet Buffalo Wedding Florist created for a wedding in November. Brilliant dark red roses, yellow calla lilies and hypericum’s make up this rich, romantic bouquet, which fits perfect with a Thanksgiving wedding. With a lot of peoples favorite holiday a few days behind, Black Friday serving as the backdrop to a wedding party dinner culminating with the wedding Saturday, it will make for one memorable weekend. Living, blossoming flowers have been known to help celebrate the promising beginning of a new life at weddings, as well as the celebration of a beautiful life passed at funerals. They are precious representations of life’s many milestones and the numerous varieties of flowers each hold their own unique message. While there is a truly meaningful message conveyed by living flowers, certain false flowers, too, hold a powerful message. Yesterday, November, 11th, 2012 marked another Veterans Day. This day is dedicated to giving thanks to the courageous acts of service volunteered by our brave service men and women who have defended the country they love. The Buddy Poppy is an artificial flower and symbol of remembrance of both those who risked and those who lost their lives to preserve our freedom. We give thanks and remember the efforts of these soldiers in many ways on this day, the Buddy Poppy being one accepted symbol and tribute. The VFW (Veterans of Foreign Wars), an organization aimed to assist the U.S. veterans of foreign wars, held a distribution of the Buddy Poppies in 1922 before Memorial Day that year. It was then that the poppy was accepted as the official memorial flower of the Veterans of Foreign Wars of the U.S. Since 1923, the poppies have been assembled by disabled veterans and exchanged for a contribution in efforts to raise money for veterans. This small gesture is aimed toward alleviating some of the financial struggles of our veterans. The small, red flower is a symbol of hope, remembrance and good will of our neighbors to help our patriotic heroes in their time of need. Read more about the Buddy Poppy and the VFW by clicking here.